In this bite-sized lesson, Derek Trucks gives you some insights on incorporating natural and artificial harmonics into your slide lines. 13-Year-Old Derek Trucks Tears It Up on "Layla"
Check out this video of a 13-year-old Derek Trucks performing the "Layla" outro and a blues jam while opening for The Allman Brothers. Watch Eric Clapton, Derek Trucks and Doyle Bramhall II Play "Tell the Truth"
Eric Clapton has premiered another song—in the form of a pro-shot video—from his upcoming album, Live in San Diego. Watch Eric Clapton, Derek Trucks and Doyle Bramhall II Play "Motherless Children"
Earlier today, the Wall Street Journal—which is world renowned for its guitar and music news—premiered Eric Clapton's new video. Eric Clapton has announced a new live album,Live in San Diego. 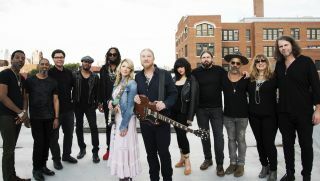 Hear Eric Krasno and Derek Trucks Team Up on "Curse Lifter"